From now on I will be writing all the reviews and they will all be of Clikits sets. 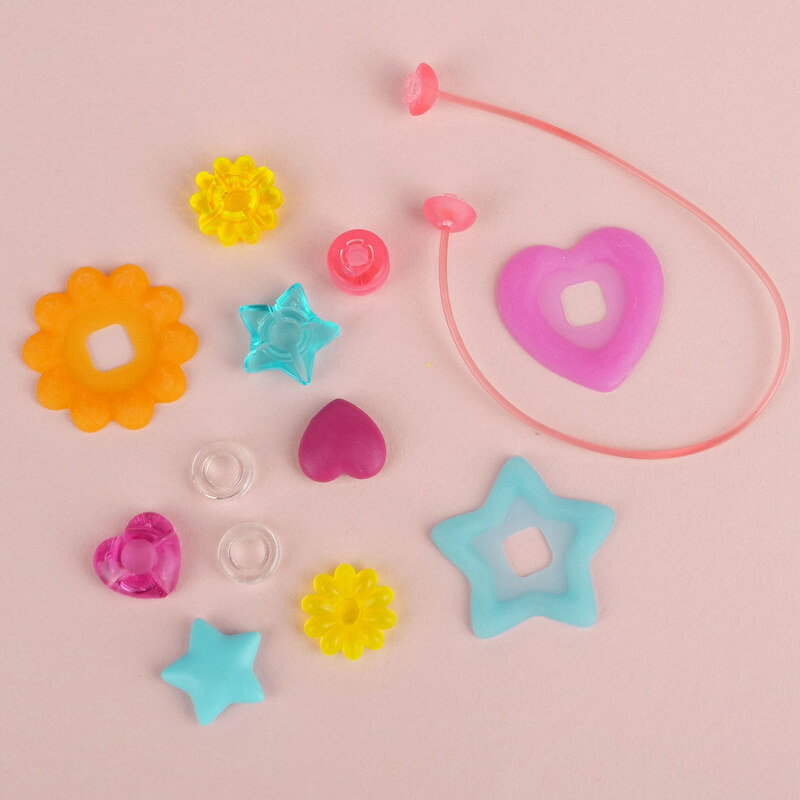 I'll start with 1386 Jewellery Sample, a polybag released in 2004 and given away at LEGOLAND and elsewhere, of which I found a few unopened ones in my stash. 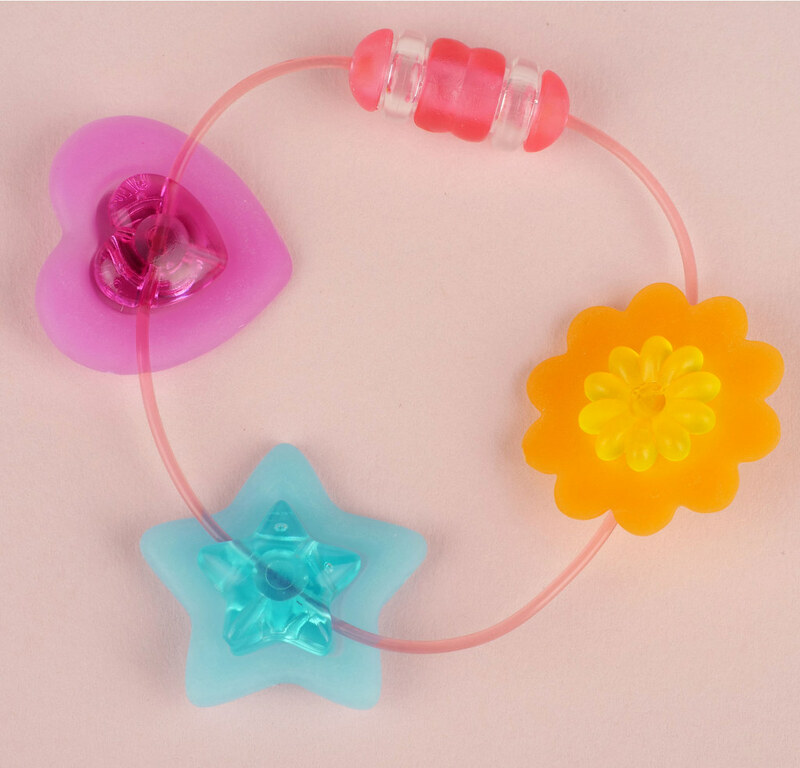 It contains parts to build a bracelet and serves as a good example of the different types of Clikits parts and how they connect. It's packed in a polythene bag rather than a crinkly plastic one as is usually the case. It does not contain instructions, just a small leaflet showing other sets in the fantastic Clikits range. There are thirteen parts inside in a variety of shapes and colours. 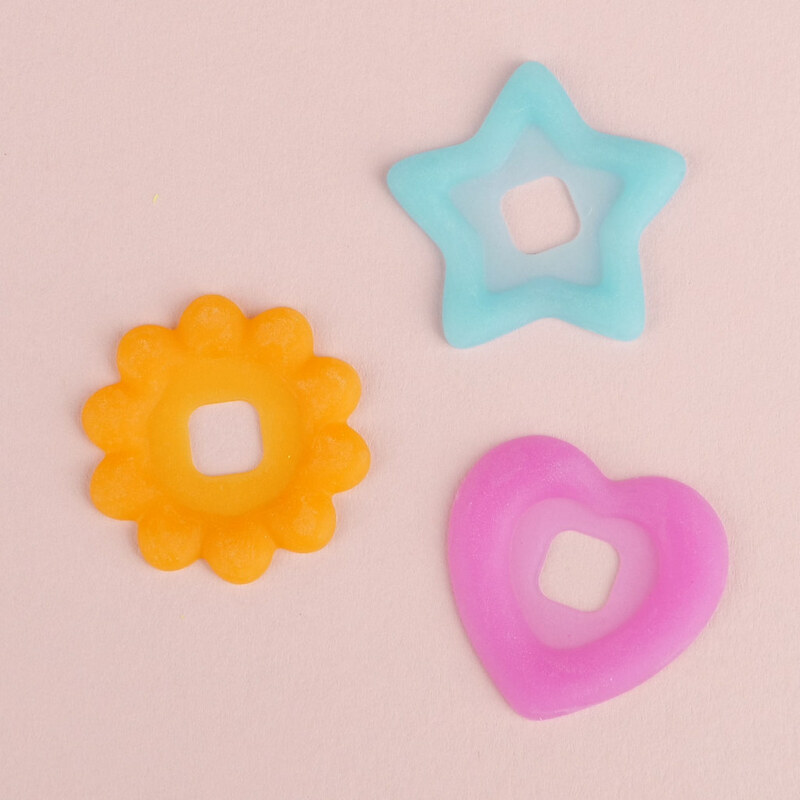 The three girls shown on the leaflet above was each associated with a particular shape of piece: heart, star or daisy and this set contains examples of each. 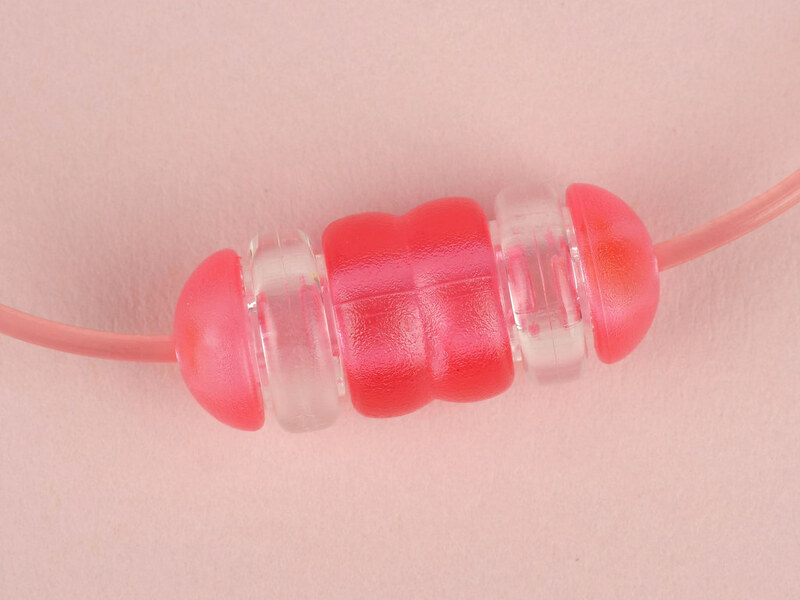 The bracelet itself consists of a flexible, slightly stretchy plastic wire terminated in pieces which have a male Clikits connector. 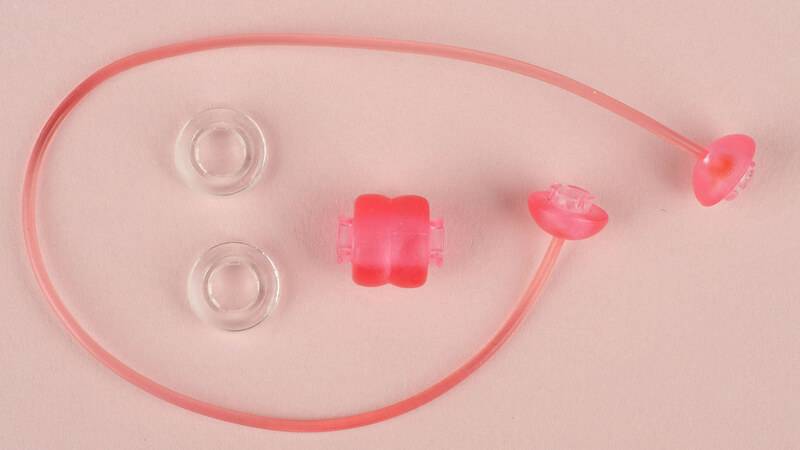 The transparent rings are effectively female-female connectors while the larger pink one is male-male. They can therefore all be joined - or rather, clicked -- together to form the bracelet. 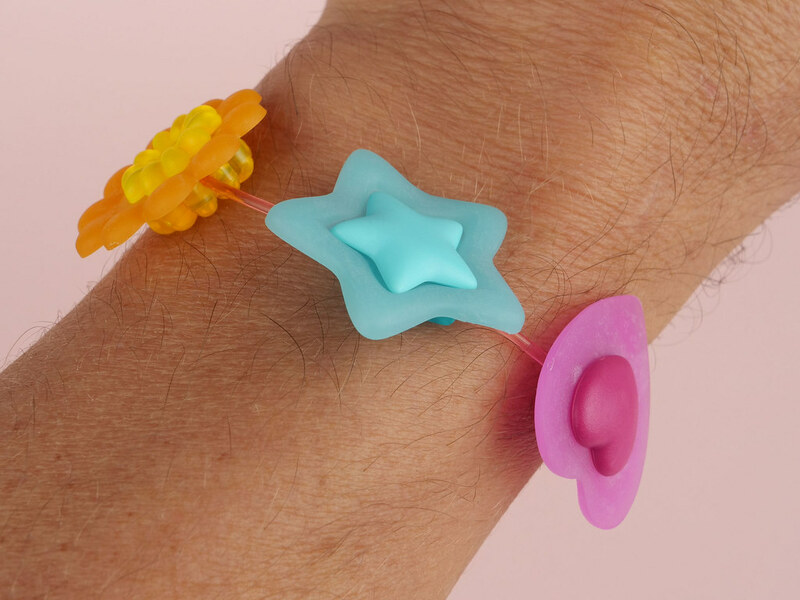 A single transparent ring could have been used to join the ends of the bracelet but they can be hard to separate if connected like that, particularly when it's round your wrist. 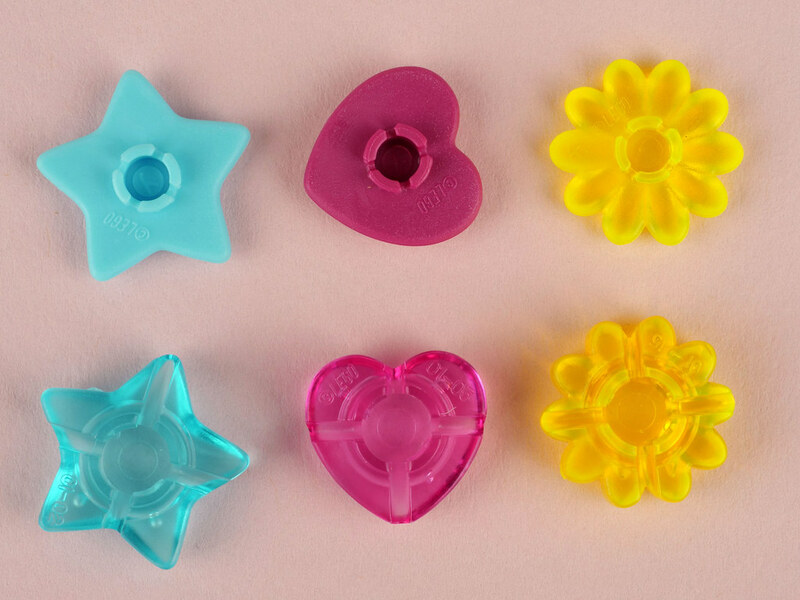 The smaller hearts, stars and daisies are produced from hard plastic, ABS and polycarbonate, I suspect. Those on the top have a male connector; those on the bottom, female. The bottom ones also have a groove in them into which the bracelet wire can be laid. The larger pieces are produced from a softer plastic and fit between the male and female parts above. 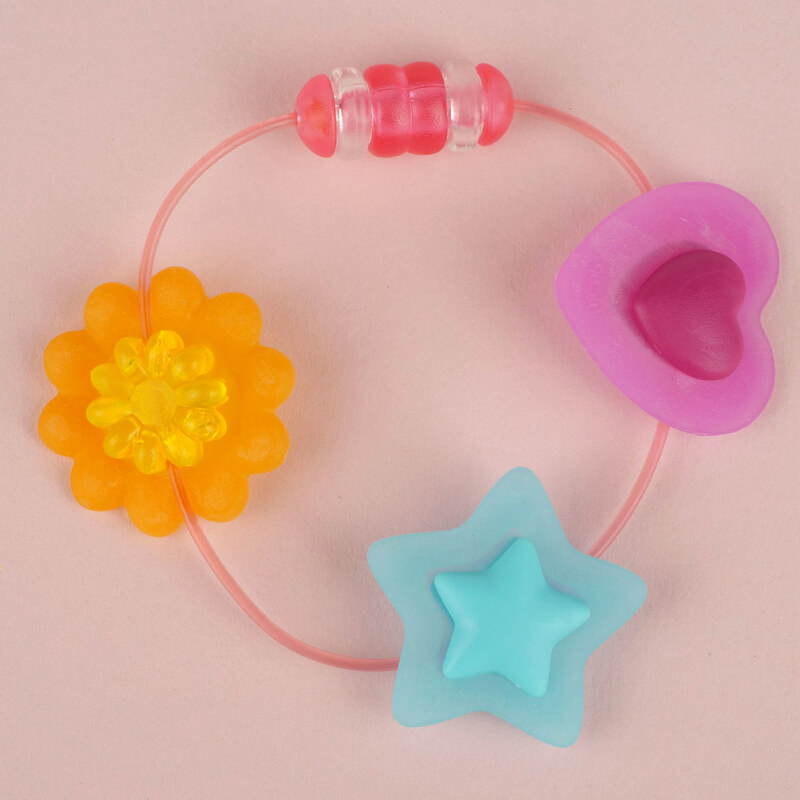 The heart, daisy and star pieces are simply clicked together around the bracelet wire, so construction takes a matter of seconds. 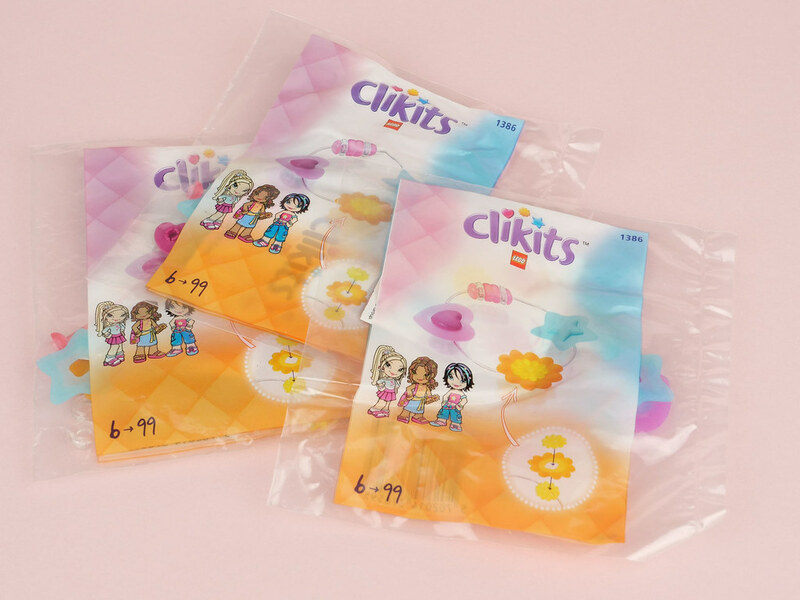 This little polybag is a great introduction to Clikits that demonstrates how the system works and is also likely to encourage recipients to seek out and buy larger sets. Unfortunately you're 15 year too late if you're hoping to get it for free but you can still buy it at BrickLink for a couple of dollars. A perfect look for that strong, hairy, muscular arm!!! I, for one, welcome our new Clikits overlords. Wait - Huwbot has an actual physical arm?!?! Are the machines beginning to rise? To be honest, one of the best and most enjoyable April Fools jokes I've ever seen! It even gave me some useful insight and info. As much as I know this is going to end tommorow, I would genuinely love to see more of these reviews. 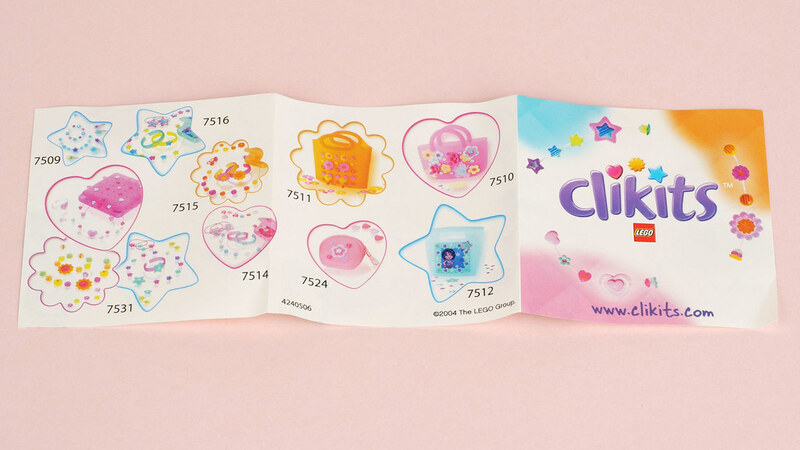 Clickits is a range I know pretty much nothing about (although I do remember when they were being sold), and I would love to be able to learn more about them. Thanks! This is great, hail the new overloads! Rise Clickits! This set was also super neat, I can’t wait for the next Clickits review. And this nice clikit bracelet is sooooo beautiful on a male pilous wrist! Clickset, oh no sorry Huw, you convinced me, I start today my chase and quest for all the Clickits range sets. Wait, how does Huwbot have a stash? Nevermind, it's not my place to ask. I'm just supposed to accept it and go buy Clikits. No don’t tell me that Huw is one of the people who actually own this set!! Augh! Personaly I think CLikits sets are VERY unapreciated. They have very unique pieces that fit normal LEGO. They are GREAT for decorations. As @lordofdragons mention, I would actually be interested in a review of how some of the clickit pieces could be potentially used in the regular Lego "system". There might be some ways to obtain new shapes by sandwiching thoses pieces between regular bricks, or other clever NPUs. Haha, one of my favorite April Fools yet! Except for the Lego Galidor movie a few years ago, that was sheer genius. Great review huwbot, nice tan by the way - thought you robots would be a bit pastier, or did you use your minion (as I assume Huw or capnrex are now named) ? Made me smile after getting mad at the LEGO pick and brick site, just what I needed! The underage-blogger syntax of the writing is a nice touch, far from the usual proper English grammer of our beloved leader...Happy April 1 everybody! A perfect start to the most ambitious/ludicrous/completely idiotic fusion MOC ever: a speed champions car... made entirely from clickits parts! Can Clikset be a thing now? Lego, WE WANT CLIKSET AGAIN!!! I think the original Clikits must have been an April Fools joke, but somehow one of the designers didn't get the memo. Rather than just disposing of all resources used up by this absent-minded designer for nothing, Lego decided to recoup some of their losses! That's my theory anyway! All hail General Huwbot and his glorious new regime! Out of curiosity, are any Clikits components actually usable for System builds? The actual "Bracelet" part and the part that serves as a clasp is especially interesting to me. Wow! Good joke! Especially that beautifully colored arm. One Small question though: WHY DO PEOPLE LIKE CLICKETS SO MUCH?!?!?! There just a bunch of creepy dolls and bracelets that have nearly nothing to do with lego!!! Can you please start charging us for the Clikit reviews? I feel like I'm committing a crime getting them for free! Hey Huwbot, does a set of all sets contain itself? This sentence is false. Try those on for size! I appreciate that Huwbot used Huw's corpse to model the bracelet, way to put that meatbag to good use! Awesome article and that arm is so handsome. I'm saying this out of love. I'm gonna miss Huwbot, and his desperate love of Clikits. I really will.